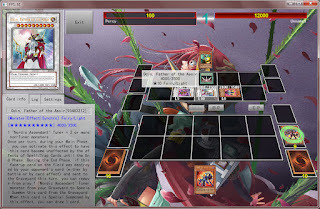 This is a status update about the features on YGOPro that I am currently working on. Just to give everyone a heads up before the next version. To clear things up a bit first, Fluorohydride is the developer of the game. The features shown in here are modifications to his source code. Please don't bother him with questions about this article. One of most often requested. With this built in you no longer need to use hamachi or an external launcher. YGOPro will download the games list from one of the available servers (see also this tutorial about the chinese servers). After selecting a room and clicking on the connect button you can start dueling immediately! 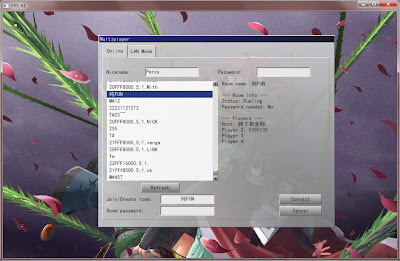 As you can see in the screenshot the room list screen is still "barebone", but will be spiced up in the future. YGOPro runs on a fixed size of 1024x640.You will be able to resize the window and play in fullscreen mode after this update. There still a lot to do before this is completed. Like high resolution pictures and bigger buttons to make use of the extra space. Also the deck edit screen is a pain in the *ss..
A beta build will be released soon. Hope you will look forward to it! Just keep an eye on this blog. can't wait for the release !!!! Thanks Percival 18.... I'm hoping. Hopefully Fluorohydride can get the card bugs fixed soon so I can go back to using this. I cannot wait for this, because I really hate using Dawn of the New Era. This is awesome. The Advantage/disadvantage background music is something I was wanting to see in a long time. this will be great, I cannot wait to the realese. Wow! I was working on a similar project but it seems you beat me to the feature. 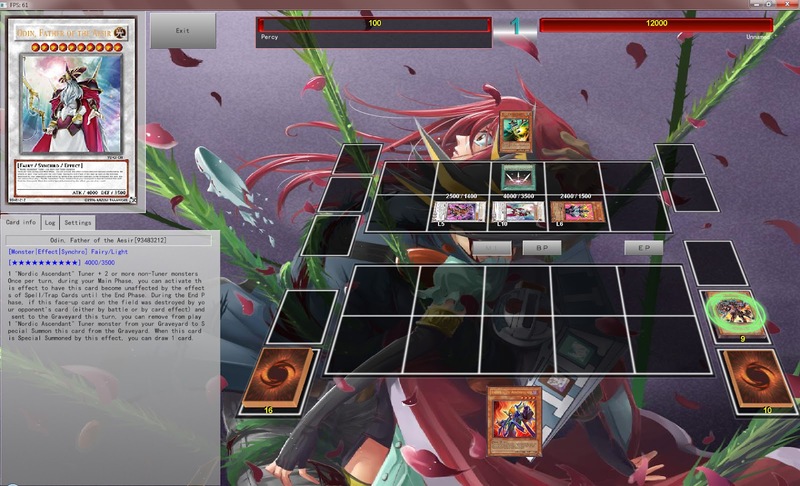 https://github.com/Zayelion/YGOPro-URI Its nice to see that the game is updating so much, I hope that the you can add in the Chinese server and the american server. Just make sure that you allow people to select their language, and possibly one day sort duels by wanted format. percyval this may-card site ! 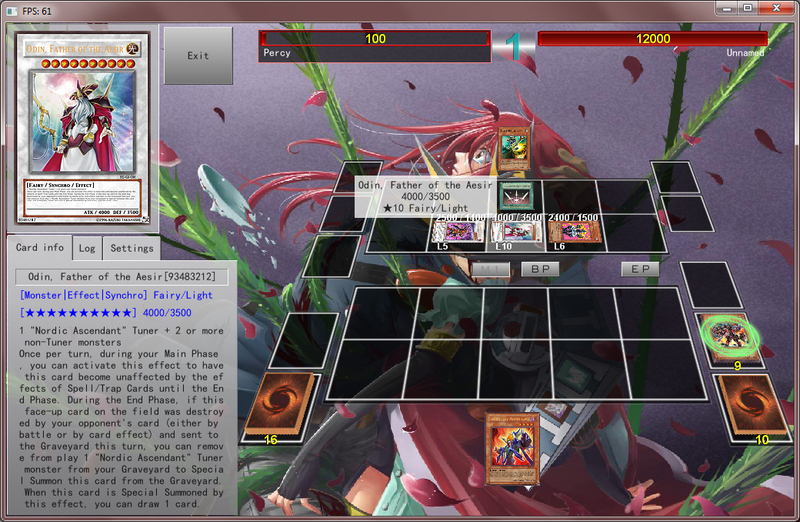 my-card game is version of ygopro? I'm ecstatic for this beta! I'm sorry about bugging you about the ADV/DISADV but it was much needed. You are AWESOME!! That advantage/disadvantage music makes me remember of tag force 6. Please, add, XYZ and Syncr summoning effect (From Tag Force 6). Add too, three types of musics; Single Battle Music, Tag Battle Music and Matchs Music. Same music for all sux a lot. yo, make it so we chose server in config file. AMAZING, Percy! Thank You for your dedication. About the program, the beast feature certainly is the fullscreen mode. One more question: Is it possible to make a "skin" for the program? Like, the current version is so "default", the buttons seems like and the windows seems like windows 95. Thank you for your attention, I hope your answer. Percy, can you help me to set a server in Russian? When you lanch the update? If you lauch it, Will you add cards that have a picture and confirmed effect BUT not out at the moments? (such us Number 91, 22, 69, 88) etc. Answer please! i know im bungee jumping without the bungee cord with this question, but ill ask anyways. wold it be possible to get a server emulator for this game so that we can host our own small private servers... even if it holds something like 30 connections that would be enough. is this gonna support our own server? could you post any tutorial on how to make my own server? Agreed, the Chinese server is small and sometimes laggy, but dawn seems to be down more often then up. So, will there be a full screen version? Also, can you please make Dark Synchro monsters? And for servers, can we use any server or just mycard? I've asked this before (so I hope you don't mind if I say it again) but can you make it such that both players must have the same banlist to duel? Would love to master goat control (lol). You could only do so much with your friends. i want a destroy effect. i want destroy card effect. Can I just ask about potentially including anime cards? I agree it would be a really fun, great idea, but could I ask how it be done- I mean would you have in the Ban List N/A, [date] and anime? and could anime be used with banned cards? or only in one format? 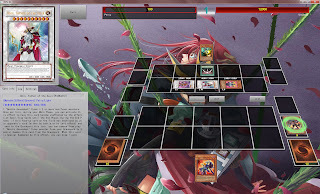 given that there is no ban list for anime cards it should probably be possible to host duels where they are not allowed, given in some circumstances they could be unfair- furthermore, what are you thinking about doing for their effects- giving then the exact anime ones, or ones from Tag Force games? Also, if they had anime effects, would that means that separate anime-versions of pre-existing cars that have different anime effects (such as say Malefic World)? how about chat feature. I mean it's hard for me to see when spectator chating because of dark background texture. and do you would give it VS Computer feature? If you add anime cards, please add Timaeus, Critias, Hermos and the rest of the cards from the "Waking the Dragons" saga. Now that the Seal of Orichalcos is gonna be released in the Legendary Collection 3, it would be good a "Waking the Dragons" deck. Oh, and the "Ride of the Valkyries" and the Valkyries from Zigfried from the "Grand Championship" saga.